What Is The Fujiwhara Effect? When two separate tropical storms or hurricanes rotate around a common center, the phenomenon is referred to as the Fujiwhara Effect. 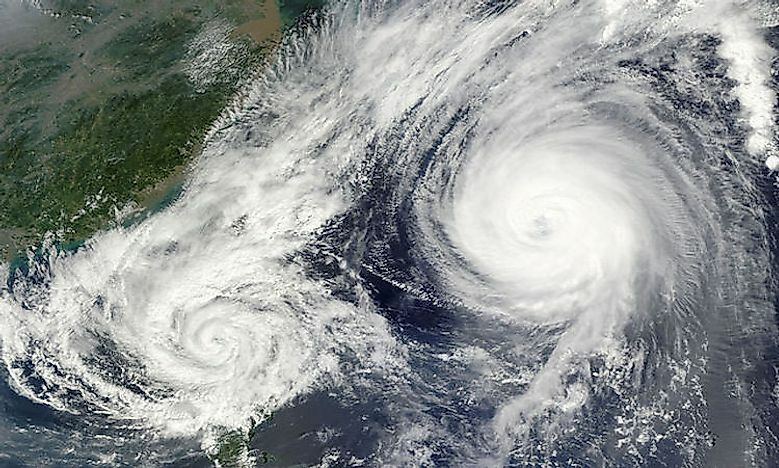 The Fujiwhara Effect is exhibited when two cyclones approach close enough to interact with each other. The Fujiwhara Effect (also named as the Fujiwhara interaction or the binary interaction) is an interesting natural phenomenon that takes place when two nearby hurricanes or cyclonic vortices interact with each other. The Fujiwhara Effect was first described by a Japanese meteorologist, Dr. Sakuhei Fujiwhara in 1921. The phenomenon was thus named after him. What Happens During The Fujiwhara Effect? The Fujiwhara Effect can occur when two hurricanes form near each other or approach each other close enough to allow the Fujiwhara interaction to take place. Extratropical cyclones can exhibit the binary interaction when within a distance of 2,000 km of each other. Tropical cyclones exhibit this type of effect when separated by a distance of less than 1,400 km. During the Fujiwhara interaction, the centers of the two hurricanes involved in the phenomenon begin to mutually orbit in a counterclockwise direction about a point between the two hurricanes or cyclonic vortices. The position of the point is dependent on the intensity and relative mass of the cyclonic vortices. The smaller hurricane involved in the Fujiwhara Effect moves at a faster rate than the bigger one about the central point. What Is The Significance Of The Fujiwhara Effect? The Fujiwhara Effect might lead the two hurricanes to spiral into the central point and merge with each other, or it might trigger the development of a larger cyclone. The effect might also divert the original path of one or both the hurricanes. In 1995, Hurricane Iris and Hurricane Humberto interacted with each other and then the former also interacted with the Tropical Storm Karen and absorbed the same. When Hurricane Iris was approaching the Windward Islands on August 23, 1995, Hurricane Humberto trailed close behind it. Soon, both were close enough for the Fujiwara interaction to take place. As Humberto started chasing Iris, it lifted north over Iris, and the latter slowed down a bit and got diverted to the left. Thus, the Fujiwhara interaction weakened both the hurricanes and both moved apart from each other. As Hurricane Iris moved east of Bermuda, the Tropical Storm Karen started chasing Iris. Again, the Fujiwhara effect was exhibited by the new interaction between Hurricane Iris and Tropical Storm Karen. The former had wind speeds of 110 mph while the latter was much weaker with wind speeds of about 45 mph. Thus, this resulted in Hurricane Karen being absorbed into Hurricane Iris. On September 1994, both the storms participated in the Fujiwhara interaction, completing a full orbit around their central point and finally collapsing to form a single cyclone. The Fujiwhara interaction between the two tropical storms diverted the Severe Tropical Storm Lionrock in an eastward direction while the Tropical Storm Namtheun was diverted southwestward. In 2008, the two storms exhibited the Fujiwhara effect and the stronger of the two, Cyclone Gula absorbed Cyclone Fame.